“The annual sports of the Rangers Football Club were held at Ibrox Park, Glasgow on Saturday afternoon in fine weather and before nearly 40,000 spectators. All the events were well contested, and in the 1000 yards invitation handicap two records were created – the all-comers’ by AG Hill, Polytechnic Harriers, who reduced E Baker’s time by a second, and the native record by D McPhee who reduced the previous time by a similar margin. The winners of the invitation events were: 100 yards: RJ Christie (West of Scotland) 5 yards 10 3-5th seconds; 220 yards: HFV Edwards (Polytechnic Harriers) scratch 22 3-5th seconds; 1000 yards: 1. D McPhee (West of Scotland) 14 yards 3. AG Hill (Polytechnic Harriers) The winner completed the full distance in 2 min 16 sec, a new Scottish native record (previous best 2 min 17 sec), while Hill’s time was 2 min 15 sec, a new Scottish all-comers’ record (Previous best 2 min 16 sec). 300 yards: 1. HJ Christie (West of Scotland) 10 yards; 2. R Colbery (Maryhill Harriers) 12 yards; 3. EH Liddell (Edinburgh University) 4 Won on the tape. 31 3-5th sec. Half-Mile: 1. D McPhee (West of Scotland) scratch; 2. WB Mein (Edinburgh University) 20 yards; 3. JC Ponsford (Glasgow University) 8. Won by six yards. 1 min 59 4-5th sec. Three quarter mile: 1. D McPhee (West of Scotland) 20 yards 2. GH Davidson (West of Scotland) 30 yards; 3. AG Hill (Polytechnic Harriers) scatch. Won by six yards. 3 min 9 sec. Eric Liddell and AG Hill at the meeting plus Duncan McPhee and there was no single race report. Well, well, well. One item above all others in the report on the Rangers Sports of 5th August 1922 caught my attention – the field in the Mile was ’embarrassingly large’ at 142! There was the usual amount of quality Scottish and English runners taking part and the report was a bit larger than in the two previous years although it had to share the available space under the headline ‘Cricket and Athletics.’ I can quote it almost in full. “Everything favoured the Rangers Football Club on Saturday – the finest of weather, a 30,000 crowd, and keen competition. The surprise of the meeting was the double win of B McGrath of Manchester Athletic Club who carried off both sprints rather easily. If memory serves, this was his first appearance in Glasgow which may account to some extent for his remarkable performance. D McPhee’s fine running in the mile which he won comfortably in spite of an embarrasingly large field – the entries numbered 142 – was much appreciated, though interest in the race would have been intensified had ED Mountain started. McPhee absented himself from the open half-mile, in which he would probably have had to cover the distance twice, but he competed in the invitation event in which he was unplaced, finishing fifth, with Mountain immediately ahead. The defeat of HFV Edward in the first Heat of the furlong meant that the anticipated meeting between him and EH Liddell in the Final did not take place. The Edinburgh man ran a fine race winning in 22 sec from the 22 yard mark. This was his only reward during the afternoon, as he did not run in either of the open sprints. In the invitation quarter-mile, GT Stevenson showed a welcome return to form, getting home easily from LS Barden with Edward, who of course ran from scratch, third. After three lots of extra time, Celtic beat Rangers in the final of the 5-a-side. “Although the unavoidable absence of A Mourion, L Duquesne and P Lewden, the French athletes, and the non-appearance of HFV Edward, the English ex-champion, created keen disappointment at Ibrox, the Rangers Sports suffered little in distinction. Without such strong challengers to oppose them, however, it was expected that E Liddell, D McPhee and CE Blewett would would accept the offer to further distinguish themselves, and it came as a surprise that the trio failed to run themselves into the prize list. The Edinburgh University man did not enter himself into his heat of the open 100 yards and in the invitation 120 yards he was beaten by a yard by J McAlpine to whom he was conceding 7 1-2 yards. He ran unplaced in the invitation 300 yards, although his time in that event was returned as 31 4-5th seconds, three fifths of a second outside the record time of the late Wyndham Halswell made at Hampden Part in June 1908. Liddell also failed to make his appearance in the open furlong which was won by H Seath, a Maryhill Harrier whose handicap will come under the axe before another Ibrox programme is arranged. D McPhee’s running at no time made its usual appeal. In the one and a half mile invitation handicap, he decided to forego his start of 15 yards, and along with CE Blewitt got off from the scratch mark. Neither the West of Scotland man nor the Birchfield Harriers had a say in the finish. McPhee dropping out of the race with little more than a quarter to go. T Riddell of Glasgow High School almost provided a rich surprise here, but the reserve power behind the Maryhill man, WH Calderwood, was too much for this youthful runner. In the mile handicap, McPhee introduced much more spirit into his effort, but at no time did he look like challenging the placed men, although he was well ahead of Blewitt when G Wason passed the judges box. An interesting report which marks the arrival of Tom Riddell at the meeting, the continued appeal that Rangers Sports held for Liddell and McPhee and the English contingent is also noted. In addition the absence of three Frenchmen is a note that they were invited and had agreed to compete despite having had to withdraw for unavoidable reasons. Was this the start of the continental involvement in the Sports which was a feature in the 30’s and 40’s? Duncan McPhee won the SAAA Mile title six times in seven years between 1914 and 1921 and the 880 yards five times in six years between 14 and 1923 but never set a Scottish record at any time. 120 yards: 1. JV Scholz (USA) scr 11 44-5th seconds; 2. R McLean (Glasgow High School); 3. FB Wardlaw (Heriots College. Note Tom Riddell splitting the two American scratch runners in the half mile as well as Liddell’s 440 yards win. Among those who have gained the international honour this week for the first time, F.B. Wardlaw, the Heriot C.C.C. sprinter, occupies a place. Like several other runners of merit, for the last few seasons he has been compelled to take a back seat to Eric Liddell. But the champion’s departure has given Wardlaw the much-coveted opportunity of representing his country in the athletic arena. Incidentally, he is the first Herioter to achieve this distinction. A wonderfully fine runner for his comparative lack of stature, Wardlaw seems to possess the happy knack of producing his best on a big occasion. The furlong is his strong suit, and two years running he has occupied third place to Liddell and McLean in the S.A.A.A. championship over that distance. He also gave Liddell a good run for it in the Eastern District Championship decided at Powderhall in June. Wardlaw was also member of the Edinburgh relay team which set up new Scottish figures at Hampden early in the season. Well known in the Meadows inter-club contests, Wardlaw has on three occasions carried off the double by winning the 100 and 220. This year, although defeated in the 100, he again lifted the 220. Representing Heriot’s against the Edinburgh Harriers last month, he further added to his list of successes by again achieving the double, and this was his portion at Galashiels this week also. His handicap performances have been equally meritorious, a notable performance earlier in the season being the winning of the open sprint at Melrose sports for the third year in succession. Wardlaw has shown splendidly consistent running in these events, but probably his best handicap performance was in the Rangers’ invitation 120 yards last autumn, when, after winning his heat off 5 ½ yards in 11 4.5 sec., he was placed third to J.O. Scholz, the Olympic 200 meters champion, in the final. Jackson Scholz as an American sprinter who won Olympic gold in 1920 in the 4 x 100 relay and in 1924 in the 200m with silver in the 100 behind Harold Abrahams. “In past years the Rangers Club has contrived to give the Glasgow public something exceptional in the way of athletic entertainment. They can be said to have excelled themselves on Saturday for it is questionable if any of their previous meetings have reached the same all-round standard of merit. This was chiefly by reason of the display given by the members of the Illinois team, who during the course of the meeting displaced four records, two British and two Scottish, but the success was not wholly due to this. There was a keen-ness among the home element which always provided the stirring finishes which go so far to secure enjoyment for the man on the terracing. If RM Osborne disappointed last year he has made up for it on this visit. At Greenock a week ago he cleared six feet five and a half inches and thus established new British figures for the jump. On Saturday he did better, clearing six feet six and a half inches and just failing to top his own world record. It was a magnificent effort and worthy of the first place in the afternoon’s sport. Next in merit to Osborne’s jumping, came the running of Ray Dodge in the 1000 yards. Dodge, who ran third to Cecil Griffiths at Stamford Bridge, refused the allowance of 4 yards which the handicapper and ran from scratch. The race was a repetition of that in the championship as the pair kept together until 100 yards from the tape, when Dodge went ahead with a fine burst of speed. This time the Welshman could not respond and was beaten by fully 10 yards. RG Clark (Clydesdale Harriers) the winner ran a very plucky race throughout and, although tiring fast, just managed to hold out. The winner’s time was 2 mins 13 3-5th sec. The previous best Scottish time was the 2 mins 15 sec of AG Hill, while the British figure of 2 min 14 4-5th sec stands to the credit of WT Lutyens. It was the best running Dodge has done in this country, and if there is some criticism of the manner in which he cut between Griffiths and McIntyre during the course of the race, there was nothing but admiration for his finishing burst of speed. Existing figures were also excelled in the hurdles and pole vault. IH Riley who clocked 15 3-5th sec in the first had however the benefit of the breeze; while Jones’s effort of 12 feet 5 inches in the pole vault was only an exhibition one, the AAA Champion having taken four tries one surmounting thirteen feet one and a half inches. A page further on we read that the meeting was held in brilliant weather and the crowd was estimated to be 30,000. Six years after the war and the meeting featured Scots, English, Irish, Welsh and American competitors and there were four invitation events (120 yards, 120 yards hurdles, 1000 yards, and the 440 yards West District Championship), seven open events (100 yards, 300 yards, half-mile, mile, 100 yards youths, High Jump, Putting the Weight, and an obstacle race) and an exhibition pole vault. And Rangers beat St Mirren 3-0 in the 5-a-side. The first two sentences of the report were accurate. Not a well written report – note the phrasing and lack of information about Riddell’s run for instance – and the following item referred to the Celtic FC Sports the following evening (Tuesday). Their Sports had normally been earlier in the year and there are several references in the reports to the performances of athletes at Ibrox over the years compared to the times/heights/distances achieved at the Celtic event. If 1926 had been lacking in glamour, 1927 pretty well made up for it. An Achilles team containing such as Lord Burghley and DG Lowe (the reigning Olympic half-mile champion) were the big attraction. There was an estimated 35,000 spectators. The report in the ‘Glasgow Herald’ on 8th August was much longer than for any so far and took up a whole column of tightly squeezed print. Extracts are below. “There was a large attendance at the sports of the Rangers Football Club at Ibrox Park, Glasgow, at which the competitors included several members of the Achilles Club and the Polytechnic Harriers. The meeting at Ibrox on Saturday brought to a close a memorable week for Scottish athletics and if the results of our contests with the distinguished visitors from the Achilles Club are scarcely flattering to our national pride, the association of our athletes with men the calibre of JWJ Renkel, Lord Burghley, DG Lowe, GC Weightman Smith and others cannot but have an educational effect which will bear fruit in the future. Progress can only come from the participation in the scratch event rather than in the much more common handicap and the two matches in mid week give point to this contention. In both quarter-miles in which RB Hoole ran against DG Lowe, the Edinburgh student showed by his proximity to the Olympic champion at the tape that he had touched a standard hitherto missing from his public appearances. Similarly Ian Sutherland in his two bouts on level terms with JWJ Rinkel in Edinburgh, indicated a distinct advance on his running in the championships, and the fact that the Englishman in these two races over 100 yards and 220 yards returned 10 sec and 21 4-5th sec respectively showed that the bigger the occasion the better does the Borderer perform. 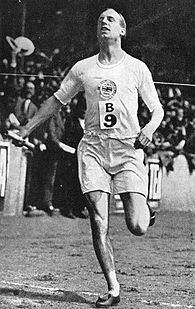 Donald McLean, the only Scot to score a success in either match also displayed excellent running in the two miles race with VB Morgan the Oxonian and, what was much more satisfactory, a degree of judgment which was so sadly lacking in the race over the same distance which he ran at the Celtic meeting last month. For once in a while the limelight was not monopolised by DG Lowe and Lord Burghley, this pair being thrown rather in the shade by the performances of GC Weightman Smith and JWJ Rinkel. The South African established a new record in the javelin with a throw of 182 feet 11 inches and broke the existing all-comers’ record in the 120 yards hurdles twice on successive evenings doing 15 seconds at Hampden and 14 4-5th seconds at Craiglockhart . This reveals consistent form which is distinctly promising for the next Olympiad. JWJ Rinkel took part during the week including the match against Ireland on Monday in no fewer than eight races, six of them scratch events, and won them all, a really wonderful feat and the improvement which the former AAA champions is showing in the shorter distances now that he has definitely abandoned running over the quarter-mile is very marked. Probably we expect too much from DG Lowe and this may account for the slight feeling of disappointment which was occasioned by his failure at Ibrox. He was not seen in the half-mile, the distance associated with all his great exploits, but confined himself to the quarter-mile in both matches. We trust that this does not indicate that he has finished with mid distance running. Undoubtedly the brilliance of Weightman Smith made the hurdling of Lord Burghley appear common-place, but apart from this the form of the Cambridge president was below his best. He was hitting the timber too often – on Saturday his progress to the tape was marked by a trail of prostrate hurdles – and this not the sort of thing one expects from a really great hurdler. The feature of Rangers meeting was the measure of success achieved by the men occupying the scratch mark. During the afternoon five handicaps were won by back-markers, two falling to JWJ Rinkel in the 120 yards and the 220 yards, the remaining three to C Ellis, the AAA mile champion, in the first class mile, to J Webster in the steeplechase and to JE London in the high jump. All five successes were to the liking of the crowd, and what is better, all, with the exception of the steeplechase where Webster had a runaway victory, were productive of keen competition. Rinkel’s running was distinguished by his strong finishing, it was this quality which brought him victory in the open furlong as, entering the straight, it looked long odds against him catching the leaders. He was returned as doing 21 4-5th sec in his heat, but this was obviously a mistake, as he was knocked clean out of his stride on the bend and must have run four yards or more over distance in consequence. Ellis had only a limited number of competitors in what was really a first-class mile. The AAA champion is not a stylist, he has a shoulder action which gives him a distinct roll but he gets along, and at half distance he had over hauled our champion. From there he gradually wore down the others and, taking the lead 200 yards from the tape, ran home the winner in the excellent time of 4 min 18 4-5th sec. McLean, though beaten into third place by his team mate Calderwood ran out the full mile and was timed as doing 4 min 23 sec his best public performance over the distance so far. The Birchfield man was a lone figure in Saturday’s race where the limit man was in receipt of 240 yards yet he made so light of his task that he finished a good 70 yards ahead of VB Morgan, the nearest man. FR Gaby is easily the most consistent of our hurdlers in that respect, on his two visits to Glasgow last season he clocked 15 1-5th sec, on Saturday he was returned as doing 15 secs, and this gave him a decisive victory over his conqueror in the international at Manchester. In passing it is permissible to note that Lord Burghley was awarded second place in this race, notwithstanding that he knocked over three hurdles. JE London was again the facile performer who impressed at the Edinburgh Universities meeting. He failed narrowly to reach the final of the 120 yards, but jumping under difficulties that were not of his own creation, he cleared five feet eleven and a half inches, this was sufficient to earn him winning brackets. There are several references in the report to other meetings in which the visitors competed and it had indeed been a hectic week for them. On Wednesday the Achilles Club met the Atalanta Club at Hampden, on Thursday that had competed at Craiglockhart against a Scottish team selected by the SAAA and on Saturday, of course it was at Ibrox. The previous Saturday they had competed in an international against France at Stamford Bridge where Lowe had won the 800m in 1 min 54 1-5th, Rinkel the 400m in 50 sec and NC Nokes had won the Hammer and Discus. You can see why Lowe disappointed by not running anther 800m and why Burghley knocked over three hurdles. The report interestingly enough points out the necessity of scratch competition but such did not become common in Scotland until the end of the 1930’s – note the fact that Lovelock, Nurmi and company were all running in handicap races at the Rangers Sports in the 1930’s. The 1928 meeting was seriously affected by the fact that the Olympic Games were taking place at the same time and that there was an upcoming international between USA and GB in London. Nevertheless, the headline in the ‘Glasgow Herald’ of 6th August read “New British Records. Another Ibrox Success.” and wont on as follows. “The Rangers Football Club added another to their long series of triumphs as sports promoters on Saturday afternoon at Ibrox Park, Glasgow, for not only was the athletics fare excellent but the organisation was so excellent that a long and varied programme was run through without a loss of time or interest. The weather conditions were perfect for fast performances, being warm without a breath of wind and the times were, on the whole, an advance on anything returned at other Scottish meetings this season. The outstanding individual performances were accomplished by Ray Watson, the American mid-distance champion in the quarter-mile; by James Crawford the Scottish furlong champion who won both the open 100 yards and the invitation 120 yards; by WH Calderwood in the three-quarter mile and by AD Turner in the Youths race. From the spectacular point of view the three-quarter mile was the most exciting. Watson who was on the scratch mark and conceding starts up to 77 yards, ran so well in the early stages that he was on terms with the field in the final lap and was apparently under the impression that lying behind the leaders he need only make his effort entering the finishing straight to win easily. He however was unaware that WH Calderwood had been specialising in sprinting in the company of Cyril Ellis, the AAA champion, and although the American was out on his own heading for the tape, he was unable to resist the overwhelming challenge delivered by the Maryhill man in the last 80 yards and was beaten at the tape by a clear two yards. Calderwood’s winning time was 3 min 4 2-5th sec from 22 yards and so well was he moving that it is just a pity that he did not run out to the full distance as D McPhee’s Scottish figures of 3 min 12 1-5th sec seemed well within his grasp. 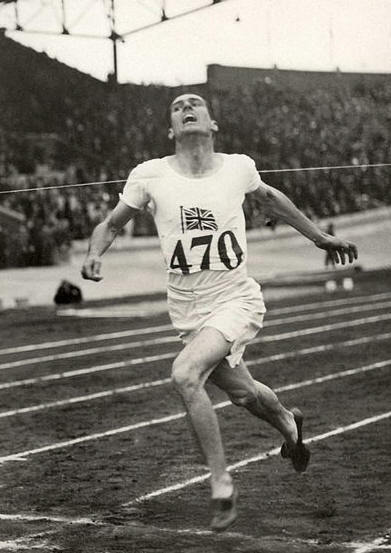 Although defeated, Watson had the satisfaction of returning the excellent time of 3 min 4 4-5th sec which is one second faster than the previous British record created by AG Hill the double Olympic winner, at Salford in 1921. Calderwood’s judgment in the race was perfect and it is questionable if he has ever run a better race in his career. It was refreshing after some of the performances he has given this season. The sparkle which characterised the running of James Crawford in the Scottish championships was maintained at Ibrox and that extra bit of driving power which he has infused into his finishing enabled him to record his double success. Running from the two and a half yards mark in the open event, he clocked evens in his heat, semi-final and final which showed consistency, while in the heat and final of the special event he was returned as running 12 sec. Not since 1924 has the Queen’s Park player shown such good form and it will always be a matter of speculation as to how far he might have gone had he devoted himself solely to running and left football alone. J Barrientos, the Cuban, who ran at Amsterdam was on the scratch mark in the special handicap but neither in this nor in the open furlong did he survive in the heats and it is evident that the handicapper had over-estimated his abilities when framing his starts. There were some good races but the whole tone of the report was depressing and what had been the best meeting of the season and would become the best by far in the 30’s and 40’s was no better than the others in 1929. 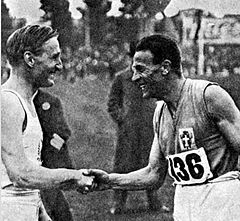 The following year would see Tom Riddell set a record and in 1931 the great Paavo Nurmi would turn out at the Rangers Sports.